The EU has fallen behind the ASEAN region when it comes to value of Vietnamese pangasius imports in 2018, according to data from the Vietnamese Association of Seafood Exporters and Processors (Vasep). Europe was the main export market for pangasius until 2015, when the US surpassed it; then, in 2016, China pushed it into third place. So far in 2018, Europe is the fourth-largest importer of the farmed fish, with ASEAN imports surpassing it in January and February. From Jan. 1 to Feb. 15 2018, Vietnam exported $238.6 million worth of pangasius, up 45% year-on-year. Exporters believe this is likely to continue strongly this year, given the severe shortage of raw material and fingerlings, and corresponding high prices. 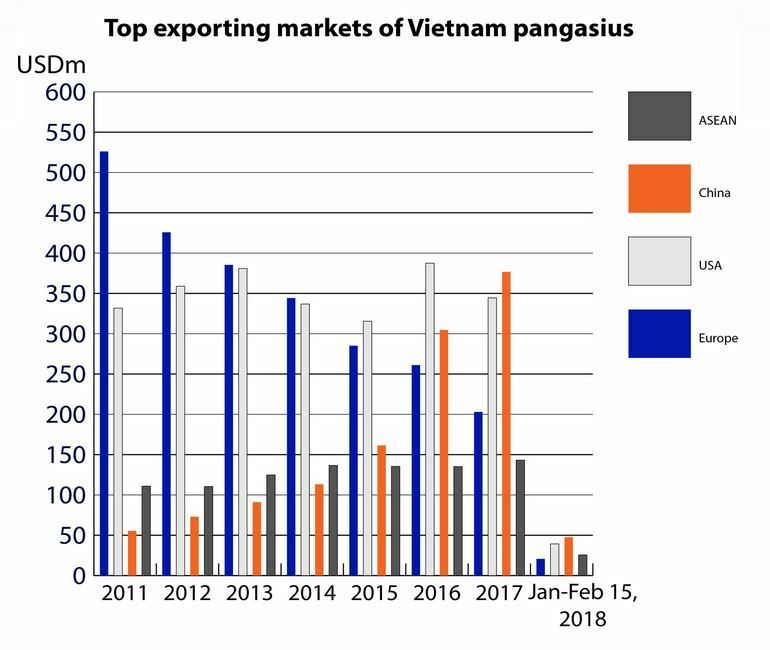 Exports to China and Hong Kong, currently the largest importer of Vietnamese pangasius, spiked by 73% y-o-y, reaching $48m. The US imported $39m of pangasius, up 51% y-o-y. Notably, the export value to the ASEAN market hit $26m, a sharp y-o-y growth of 104%. Vasep does not expect any significant change in the rankings for the rest of this year. Three large and potential markets -- Mexico, Colombia, and Saudi Arabia -- also saw impressive growth, at 45%, 100%, 116% respectively. It is expected that the first two of these will maintain positive growth rates for the entire year. Exports to Saudi Arabia, on the other hand, are in an ambiguous situation as its Food and Drug Authority recently ordered a temporary suspension of fish and shrimp imports from Vietnam, following a quarterly report published by the World Organization for Animal Health which shows that white spot disease and acute hepatopancreatic necrosis are present in Vietnam.